More Uptime. Less Downtime. More Profit. 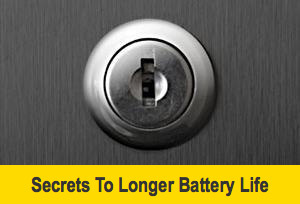 That lead-acid battery powering your golf car doesn’t want you to make money. Cleaning corrosion, adding water-even scrapping dead batteries and buying replacements. Golf course managers and maintenance departments fight every day to keep their fleets up and running and generating income. Maintaining that fleet is a time- consuming service that costs you money and makes you none. But now you can solve that problem with ThermOil Products Battery De-Mister & Battery De-Sulfater. 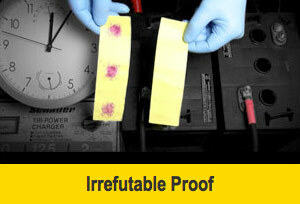 Thermoil has been treating batteries since 1992 and both of there products are 100% Guaranteed! Thermoil Battery De-Mister is a one-of-a-kind, patented battery oil that took Kendal Oil Company and New Castle Battery Mfg. Company’s top engineers almost three years to develop and is guaranteed to work every time in any non-sealed lead-acid battery, said Thermoil Inc. president Terry Fellner. 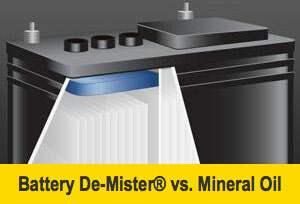 By eliminating corrosion and keeping the chemistry of the electrolyte the same, your battery can now enjoy it’s full life which in many cases is double that of the same battery without De-Mister. You will reduce water consumption an average of 5 to 7 times, although I have often seen reductions of up to 10 times, and significantly reduce sulfation, toxic fumes and the risk of explosion. top of the battery caps and onto surrounding equipment. This mist is corrosive and over time can ruin both the battery and surrounding mechanical parts. Each time the battery is charged, the problem worsens. This patented oil (Battery De-Mister) is lighter than acid and water, so it will always float on top of the electrolyte. The result is that during the charging process the bubbles that would otherwise break violently on the surface of the electrolyte and carry out the damaging mist now hit this layer of oil and rise slowly to the surface, where they will break harmlessly. With virtually no mist and much less gassing, you now eliminate corrosion on the battery cover, posts and cables, as well as all electrical and mechanical components around the battery. In addition, the chemistry of the electrolyte remains the same so now the battery can perform as it was intended to. The company’s web site contains several videos showing how to treat your battery, how the product works and a demonstration of the product at work. Fellner says watch the Irrefutable Proof video. He said that your battery supplier is going to tell you that they tested it and it does not work or that it is snake oil, that it voids your warranty etc. but Fellner stated just add the product to half of your batteries and watch what happens. You got a golf cart that has 8 batteries then just add it to 4 of them, if it has 6 batteries then add it to 3 of them etc. This test is irrefutable because your batteries will have identical make, age, size and are subjected to the same charge & discharge conditions you will soon see how ThermOil® products stack up. Fellner says go to the web site and click on the icon that says about Thermoil. After reading about Thermoil’s history you will completely understand why the battery companies do not want to work with us. Also read the testimonials under golf. They also have a video on there companion product Battery De-Sulfater. If you have sulfation problems then Battery De-Sulfater is for you Fellner said. Both products are available in 12-ounce bottles and come with a 100 percent Guarantee. Visit www.thermoil.com or call 800-221-5351 for more information.